This Lake Allatoona Bass fishing guides report is from Matt Driver. Bass fishing is good. Thirty to 40 fish days are not uncommon. This month fish are feeding, and we will see a good bit of schooling activity. As the water temperatures cool into the 60s and possibly toward the 50s by the end of the month, this is a great time to throw the jerk bait. We are using the Spro McStick in both the small and large sizes. It is good to target windblown rocky banks in creeks off the main lake. Spend a little time looking at the points and underwater islands with the Lowrance Structure Scan and Down Scan technology to find baitfish in these area before fishing. This will help narrow down where the fish are. We use a medium action spinning rod with 10 pound Sunline Sniper fluorocarbon. Until water temperatures drop, use a very erratic retreat. You will catch spotted bass, hybrids and white bass. There is also a good crankbait bite, as well. This time of year, it is also very productive fishing a jig and a Picasso shaky head with a Big Bite green pumpkin finesse worm. There are still a good many fish on bluff walls. Most of these fish will remain there all year long. So if fishing gets slow, try these areas. Don’t forget that November is also a great month for an early morning buzz bait bite along the same bluff walls. Line side fishing is good. The bite is starting to improve and will only get better as we enter into November. The sea gulls should be showing up in the next week or two and this will make finding the white fish a little easier on all of us. Right now we are spending most of our time on the north end of the lake. Free lines and planner boards early and down lines after the sun gets up. After that trolling umbral rigs and using jigging spoons we be the key to catching numbers on Allatoona for the next few weeks. The best bite going right now is from Little River to the S turns and then there is a secondary bite from Kellogg’s to Bartow Carver beach. That bite is hit and miss right now. And will remain that away until the mid section of the lake completely turns overs. Spend a little time looking at the points and underwater islands with the Lowrance Structure Scan and Down Scan technology to find baitfish in these area before fishing. This will help narrow down where the fish are. Most of the fish we are catching right now are 18 to 24 feet deep. And can be found on points, humps and flats early. And after the sun comes up your best bet will be out over the river channel. The top water bite right now is decent. But look for it to pick up in early November. 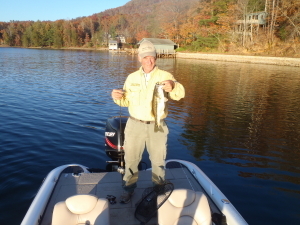 November is one of my favorite months to fish Allatoona. Remember to be universal when it comes to techniques this time of year. Striper Soup has plenty of bait on hand right now. We still have plenty of days open for November. Give us a call at 770 827 6282 and book your trip today. Copyright 2014 Southern Fishing Schools Inc. calls us to set up a school Maps and Depth Finders or SONAR and Rods Reels and Lures for Bass. 770 889 2654. Im trying to find a half way decent shore fishing spot for my daughter and i. She is 5 yrs old and to be honest neither of us have any idea what we are doing. We were going to sweetwater creek and had fun for a awhile but havent caught anything in over two months and Im afraid she is going to lose interest. Not looking for large fish, just anything to keep her interested. Im surprised you haven’t have any luck there. Have you tried live earthworms on small hooks around the docks for bluegill. at five, she will get bored easily Im sure but at least there other things are available for her to do.